Winter’s not on its way, people; it’s here, now. And here to stay this time. Temperatures below zero, wind chill making it feel a lot colder. We had our little reprieve last week, temperatures on the plus side, the grass making its last, brief reappearance until April. Hope you’re ready for it. And I’m not talking about putting on your snow tires, or stuffing the freezing rain shield into the back seat, just in case. I wrote about all that in a post last week. I mean ready for the cold itself. Ready to sally forth in the morning cosy and warm in your winter togs… looking fabulous. And in a Canadian winter staying warm usually means a down coat, jacket, vest or whatever. Not to wear all the time necessarily, but to have when it gets really cold. I bought my first down coat in 1989. Until then I had eschewed all forms of puffy wear, parkas, fur-lined hats or anything bulky. Yuk. But that winter I was coaching the girls junior volleyball team at my school. The season was from November to February. Practice was three times a week at 7:30 A.M., which meant that I had to be out the door by 6:30. In the dark. In the cold. Lugging my briefcase, my gym bag, my lunch, my purse, and my teaching clothes on a hanger. Sometimes (okay…often) while I was shivering and scraping the car windows, Hubby would race out to the driveway, calling to me and gesticulating with my lunch, or briefcase… or something… that I had forgotten in my rush to get out the door. Have I said that I’m not an early morning person? 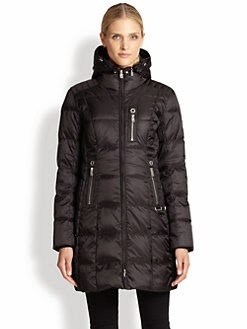 Anyway, the cold finally won out… I capitulated and bought a down coat. I was still rushing every morning, but at least I was warm. Sadly, in my big, bulky down coat, I looked a little like these guys. Scratch that… I looked a lot like these guys. Thus was my hate-love-hate relationship with down clothing born. Until then I had only hated it, but ohhhh it was so warm….creating a major internal-fashion-conflict between my desire for style and my need for practicality. Last winter I went looking again for a down coat. If you remember anything about last winter you will remember the cold… and possibly my whining about the cold. Polar vortex, anyone? And much of what I saw was, well…. see for yourself. Too long and shapeless… and simply unflattering. Too puffy. 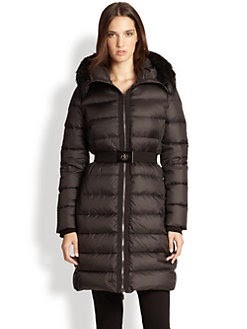 Seriously, this Moncler coat looks over- inflated. And cinching it at the waist like that just looks weird. Ugh. Too many buttons and flaps on this Burberry jacket. And the Dawn Levy coat. Really? 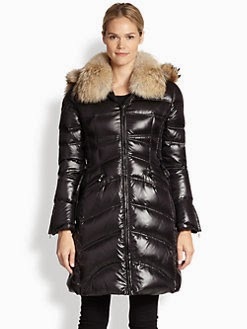 The shiny material, is well… shiny, and then add faux fur and chevron-shaped down pockets and then a hood. Whoa. I’m even starting to like the Moncler coat above… just because it’s not as bad as these two. 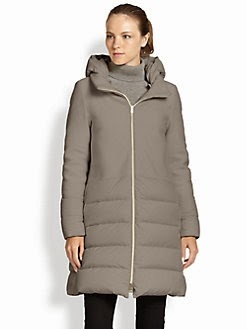 And this DKNY coat is just plain ugly. And kind of… square? Note to self…always check the rear view image. And they’re all black, or grey. And depressing. But I did not give up. I did not fall into “the depths of despair” as Anne (with an ‘e’) would say. There would be a coat out there for me somewhere. A coat that was not too long, or too bulky, or too shiny, or have too many doo-dads on it, or make me look like a bus from the back. A coat in a lovely colour, that would cheer me up on a cold winter’s day. 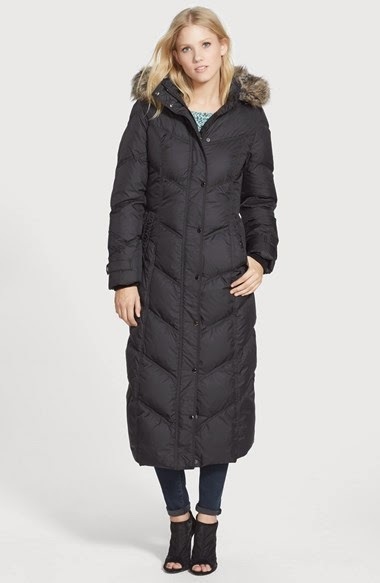 A coat that would fit properly, and not be too tight over the hips or too puffy. A coat that would be a bit fitted through the waist, and thus be flattering. As flattering as it was warm. Maybe a bit like these. I love all of these coats. They all have something that makes them chic. Good cut, some detailing…but not too much. I could go home with any of these and be happy… and warm. But what I found last winter was not one of these. But something more like this. In fact quite like this. See. 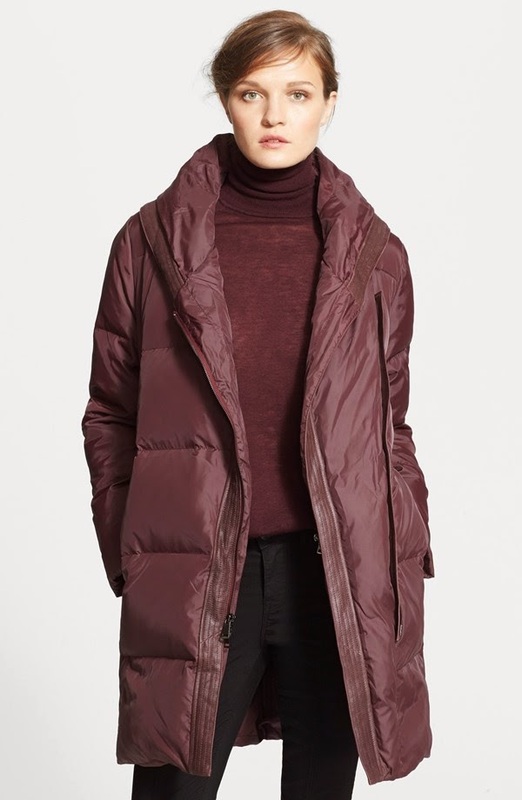 This is my new-ish down coat from Zara. It’s a bit more burgundy than the Vince coat. It’s a bit puffy, almost as puffy as the Moncler coat, that I hate, above. But because my Zara coat is nipped in at the waist, and a bit flared at the bottom, the puffiness doesn’t add width around the middle. And this is verrrry, very important. It’s not too long. And although it has an elasticized belt, I never wear it belted. I think belting it destroys the line of the coat. So I just tied the ends of the belt into the belt-loops like my friend Liz taught me. I love my down coat; it’s stylish and practical. I especially love the colour. Burgundy is a good colour for me; it makes me look less pasty in the depths of the winter. It goes with everything… grey and black and white…and my brown Yoga jeans I’m wearing here. And it looks great with several of my winter scarves. I’m a happy down- coat-owner. You could say that my down coat and I have a love-love relationship. Yep, my little journey has taught me the secret to wearing down clothing; it’s kind of like the story of that little girl with the curl in the middle of her forehead. When it looks good, it looks very, very good. And when it looks bad it looks horrid. 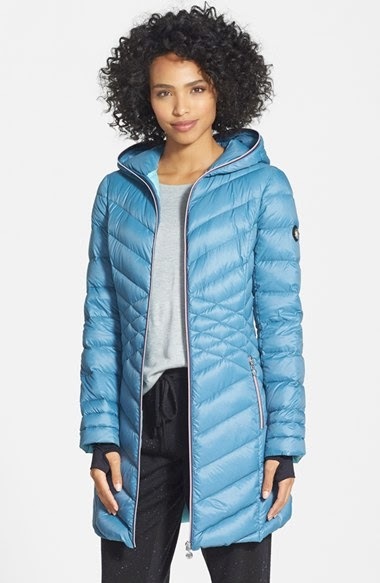 So if you’re shopping for a down coat this winter, and I would highly recommend that you do if you live in Canada. Please, please shop around. There is a coat out there for you somewhere. A coat that is not too long, or too bulky, or too shiny, or with too many do-dads on it. 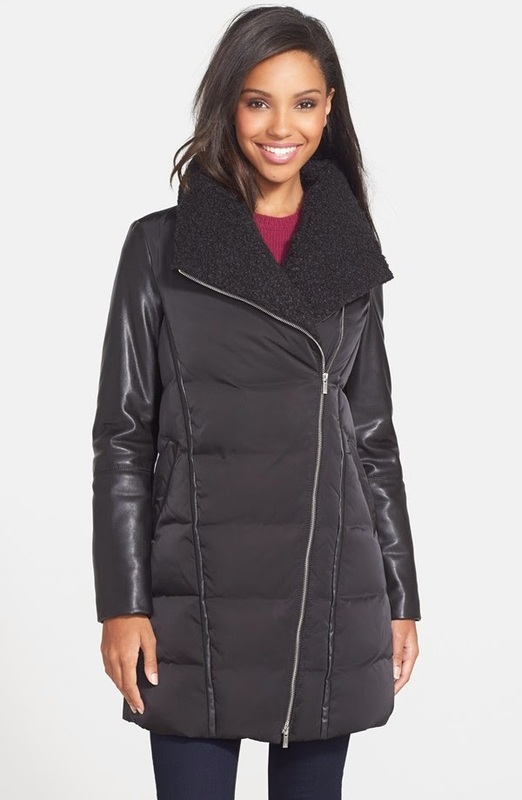 A coat that will be as flattering as it will be warm. Oh…. and don’t forget to check the rear-view image. This is verrrry, very important. Do tell…. are you ready for down coat weather? Or maybe you don’t even need to worry about the cold. Sigh. Lucky you. Cheers! 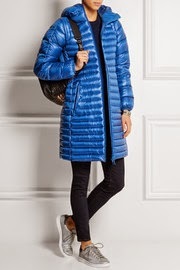 On finding "just the right" down coat. I agree with you that that little nip in at the waist is what distinguishes flattering from frumpy. My down coat was a surprise purchase, as I wasn't shopping for a coat. My first ever down coat, it's a black Michael Kors. With just enough detailing to be chic, enough length to cover the essentials, fitted enough to be flattering and slimming, enough warmth even for a Canadian winter. I'm delighted. I have a whole smorgasbord of scarves to add panache and banish bleakness. And I get compliments on it all the time. You're right. It's a great season for down coats. "Mon pais, c'est ne pas un pais . . . c'est L'hiver." So a French song goes. Enjoy your lovely new coat! 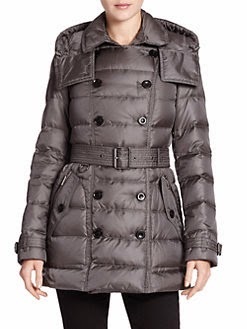 I've seen some of the Michael Kors coats, and they're lovely. And I agree that scarves can really cheer up a black coat. Congrats on finding YOUR first ever down coat. And thanks for reading. Thanks Wendy. I actually like grey too. My favourite turtleneck is grey. I think that the coats I didn't like were perhaps too muddy in colour. Thanks for reading my blog. Next time let me know where in Yorkshire you live. Sigh. I do love Yorkshire! Hi Susan, your coat is very stylish – the huge collar looks like it will do the job of a hood. I bought a Lands End down coat a few years ago – it's ok, not really warm enough for, say -30C (but then I probably wouldn't go out in that!) but the colour is lovely; Regent Blue, a purpley blue. I'm pondering getting a Canada Goose, but I'm not too keen on the very visible label. 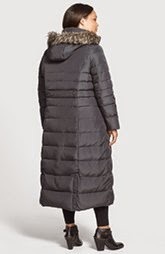 However, I've recently come across another Canadian brand, Quartz Nature, made in Montreal, and I'm going to look for their coats – one plus is that they are machine washable. I've seen all kinds of Canada Goose coats…and they're not all created equal. Some are lovely and others are dreadful. I'm with you on the very visible label. I must look up Quartz Nature…I've never heard of them. Congratulations on finding a coat! I’m jealous! I, unfortunately, haven’t been able to keep up with your fabulous blog for the last little while… because university is hard… who knew?!?! And while I’m told human beings are encouraged to breathe quite often, I haven’t been very good at that lately. Thankfully things are calmer now so I was able to read something I actually wanted to read for once. In all seriousness, I hate everything about winter fashion! There is potential for cute wintery clothes, but they don’t exist in my reality. All those cute boots are theoretical to me because when I put them on, they’re instantly not as cute! It’s so frustrating. I hate coats, I hate pants, I hate footwear… Nothing good comes from dressing for winters in this entirely too-cold country! Let’s start with coats, shall we, since that was the topic of your post. I have two choices. Well three because I suppose I could also choose to freeze by choosing neither option A nor B.
I can’t find a decent coat that will cover what it needs to cover without being overly large in any dimension (and also not too small…). Well not one that anyone can afford anyway. The problem with pants in the winter has to do with warmth. In the fall I can wear whatever kind of jeans I want; skinny ones, straight-legged one, even ones that flare at the bottom (but not like odd-looking bell-bottoms) and I will find shoes that look good and fit, either under or over, appropriately. But in the winter, usually my legs are cold so I have to wear leggings, but then I can’t wear skinny jeans. This ties into layering in the winter in general because it’s ridiculously cold outside, but too hot inside Back to the shoes issue, normally whether under or over the pants, any shoes will be fine. Not so in winter. They have to be boots and they have to be warm (read: thick). They have to be waterproof to guard against the knee-deep white snow! All of these factors, plus my large calves mean I am never happy with my winter footwear. It's truly awful! Another problem is the size because most, if not all, boots I've seen/tried on are both too small and too big at the same time because they won't fit over regular jeans but they're too big for the jeans to go over them too! And then there's the issue of layering because it's ridiculously cold outside but so incredibly hot inside… So it feels great to have, as mentioned earlier, my leggings under my jeans (though that means I can't wear skinny jeans) and my undershirt under whatever top I'm wearing… but once I get inside it's too hot and I inevitably don't want to miss a second of conversation so I won't excuse myself to go to the bathroom to take off my underclothes so I sit there, uncomfortably hot. And busing! Oh my God, do not get me started on busing in the winter. I could go on, but I should probably stop. Anyway, congratulations on your lovely coat! And thank you for maintaining a wonderful blog 🙂 Sorry I hijacked the comments section and wrote an entire blog of my own! If only essays were as easy to write. I'm smiling as I read this, Rita. I can just hear you fulminating on the clothes issue! Combine winter with busing…and I'm with you…what DOES one wear. They need to invent overwear instead of underwear…then you can easily shed it in public and not have to miss a minute of whatever you're involved with…classes, coffee, or …whatever. Lovely rant, Rita. Hope uni is going well! Hope to see you for TBT Fashion link up & enter for a chance to win a blanket scarf & an amazing mascara. Thanks Alice. I tried to link-up on Wednesday night, but was unable to do so. What time do you usually post the Link-Up? Hi Susan, the link up normally goes up on Wed at 9:30 PM PT. Susan: THis is wonderful! and I love Rita's rant too! I can so identify with both of you. Having spent 25 years in almost polar vortex country aka Hudson Valley home of deep snows and no garage….I feel for you. Have to say, I hate winter. That's hate in capitals! So does hubby. And that is why we ended up in North Carolina. Truly. Retirement was coming and we knew, oh yes, we knew , that the South was calling! If you get really desperate come meet me in Charleston or Savannah and we'll have a warm time! Anyway, stay warm, and thanks for visiting my blog!!! Thanks Libby. We travelled to North Carolina and parts south last winter for a couple of weeks. ..Jekyll Island, Savannah, Key West, Naples. Had a really great trip. Really loved Savannah! I hear you; waiting for buses (or trains) can be very demoralizing when you're cold. And in February we're just sooooo sick of being cold, eh? Thanks for stopping by. 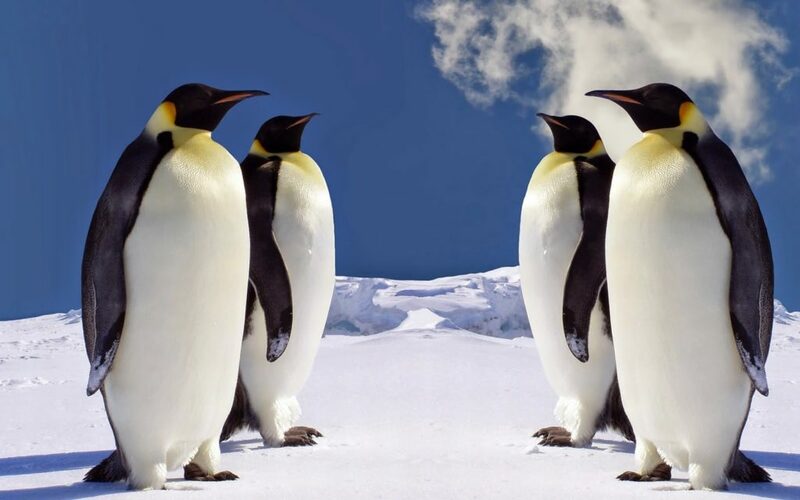 I've never actually had a down coat but it made me laugh so much that you've compared them to penguins. Actually only some of them do! I don't think your burgundy coat looks like a penguin, I like how it's so fitted. You look great. Thanks Lorna mai. I love the shot of the back of the penguins…that to me was sooo appropriate! Thanks for stopping by. Never been a down coat fan but you've carried it off splendidly. In fact, I think your coat color may be the Pantone color of the year.